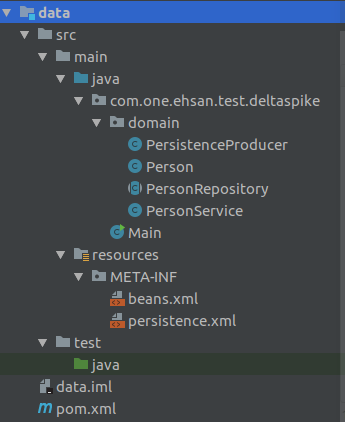 I'm using DeltaSpike repositories to persist an entity in Java SE and I'm using file based H2 database. The problem is that while there is no error in the console, nothing gets persisted in the database. I checked the database contents using an standalone client. I also tried to fetch the contents using the repository right after the persistence is done, but got no result. When I try to persist it directly using entity manager (pure JPA) it gets persisted and I can see the record when I open the file in a GUI client. Does anybody know what may have been missed in (probably) DeltaSpike configuration? Or is it an expected behaviour in such a configuration? Browse other questions tagged java jpa-2.1 deltaspike deltaspike-jpa . Where (which layer) to put Entity query methods, “persist” methods etc.? Wildfly - deltaspike - transaction not committed? Is it possible to inject spring data jpa repository into java persistent entity?